Published January 20, 2012 By Anna T. This post may contain affiliate links. Regardless, I only recommend sites I've researched and/or used and trust. Clickworker is a company based out of Germany that pays you to work from home doing short tasks. This is non-phone, and all you need to complete the work is your computer and internet connection. Clickworker appears to be pretty similar to Amazon MTurk and other sites where you log on at your leisure and complete short tasks for pay. The amount you earn will depend on the project you're working on. In their FAQ, Clickworker says they think most of their workers average around $9 an hour. Sometimes you might make more and other times you might earn a good bit less than that. It just all depends on the types of tasks you are doing and how complex they are. I'm finding conflicting information on when they pay. The Clickworker website says payments are processed when your balance reaches $10, but I've also read around the web (not on the Clickworker website) that they have recently switched over to paying weekly regardless of what your balance is. I think that they actually do pay weekly, but have not updated that info on their website. Either way, it probably isn't hard to earn at least $10 here in a week if weekly pay is something you want. The company processes bank deposits monthly. Paypal (for US residents only) or direct deposit to a SEPA bank account (non-US residents). They offer all sorts of projects — everything from writing to search engine evaluation tasks. There might always be something different to do each time you log in. You will only have access to tasks you are qualified to do. In order to determine whether or not you are qualified, you'll have to take a short assessment for each type of task. These may or may not be retaken if you fail depending on the type of task. You won't see the money you've earned for each task reflected in your account balance until the requester (person you are doing the task for) approves it. Sometimes this happens very quickly and sometimes it does not. I think most people see their stuff reviewed and credited within days and some within a few hours, but there may be the odd occasion where it takes weeks to get credit for your work. Some people really like this site for extra money, but I have seen some complaints. However, the complaints have mostly been directed toward specific tasks and not necessarily Clickworker as a whole. There are a lot of people who get annoyed when it takes a long time for the work they do to be reviewed, and this is understandable since you can't be paid until your work is reviewed. Clickworker does appear to pay and pay on time per various forum postings I've read online. Go here to create an account on Clickworker. For more details on working at home for this site, you may want to check out this eBook on Amazon. Note that I have not read this book myself, so if you try it, please let us know how you liked it! Get a membership to FlexJobs, the most trusted job board with flexible and remote work that is guaranteed to be scam-free. Get 30 percent off a membership with promo code AFFILPROMO. I've been a member here for years, and I love it! Clickworker can suspend your account at anytime. They will not not provide you explanation. Compensation you earn will be withhold indefinitely. Your account will be barred from logging in. Their only form of contact is email support and they will not reply you. You will not get a disclosure from them nor compensated for money accrued for work completed. I don’t recommend joining Clickworker due to their lack of integrity. Do your due diligence, there are few other such companies that offer the exact same type of work. I just registered to use Clickworker, but I have one reservation. They are requiring that I send them a copy of my W-9 form in order to get paid. They already asked for my Paypal information and my social security number (not sure why), so why do they need a W-9 form? The IRS requires that information. Since you will be paid for the work you do/surveys you take, and the potential to make $600 or more a year exists, it appears the company is ensuring it has covered its regulatory obligations by requiring the information up front from all potential workers. Much better than trying to get people to do it after the fact. If you do not feel comfortable providing the information, then I would not advise this as an option. Is Clickworker dead? The site is up and running, and I was able to register, but I have only been given one assessment test for English, (perfect score) and the only tasks available to me are mobile tasks that require a smartphone or tablet. Most of these are surveys or app downloads. If I refresh the job list often I will occasionally get a $0.03 search task that takes about a minute to complete. I registered for their forum a couple days ago and I’m still waiting for admin approval that I suspect will never happen. Most comments I find about Clickworker are at least a year old so I am starting to think Clickworker is a failing/failed enterprise. Anybody have recent info on this company? Update: After a few days I did get cleared for the forum, which is fairly active. I asked support about the lack of assessment tests and jobs – seems they have software issues with the tests, and also with the UHRS tasks. No word on when these issues will get resolved. Bottom line, Clickworker isn’t dead, just currently broken. Thank you for posting this. I was wondering the same thing. I hope this gets fixed soon as it has been a while since you posted this. Thanks for that, Dev and Jessica, I was wondering the same, having signed up a week ago (beginning of January 2018). I’m still awaiting approval for the Forum, not sure why this takes so long. There was one other test I was able to do beside the English test (in Dutch….) but the work doesn’t seem to be there, just surveys day in day out. Yawn and grumble… Is this just somebody’s hobby? It seems like such a good idea!! how to complete profile at clickworker.com I am not be able to complete it. I recently joined click workers on 14 April 2015 I have yet to receive any type of payment I do not know if it is because my account is not up to $10.00 yet. I do like the work that they have I was able to get URHS I believe it’s called cert. Some of the tasks can be little boring however most of them I do enjoy only down side I wish that I was able to use my fire fox browser in stead of explorer however it is not huge problem. I signed up after reading your review, as well as signed up with other sites to thanks to your blog! I signed up with this company to make extra money because every penny counts with the way things are today. This site works perfect because I can do taks after I get home from my regular job as well as I can work on tasks on my day off and any time of day or night so this works perfect. I just wish pay out was little quicker. However I have not logged on everyday which could be one reason of course pay out is not quicker! Other then that I’m happy with this site thank you for sharing it with us as well as other ones. You’re welcome! I am so glad you like it! Thank you for stopping by and sharing the info on Clickworker as well. As of this morning Sept 2,2015 yes they did send payment viva paypal and not it dose not have to be $10 in case anyone else was wondering. I’m happy with this company thanks again for sharing I hope more people look into it. There never seems to be any work to be done, maybe because I’m not a U.S citizen but its very discouraging. I found a site I believe to be better, its a pay tt click so it doesn’t pay too fast but the twist to it is you can buy ads to promote whatever you want to promote, and get more money when people click your ads. I’ve tried Clickworker. I was making about 1 cent a minute. The upload time was slow and a lot of my tasks did not go through. Now I’m doing Mturk. Mturk is normal and it works, don’t expect a lot of money but at least I’m treated fairly as an American citizen. I have had Clickworker for for the last couple years. I must admit that I was never impressed with what they had available so my visits were very infrequent. I assume my lack of knowledge about the UHRS was likely the reason I didn’t find work there productive. With that said I read the reviews here the other day and decided to test and try out the UHRS tasks. I am currently travelling outside the US and when I attempted to login, they said I did not have an account. After contacting support I found out their “security” had flagged me as it has others for different reasons. I think have been to their site twice previously during this trip with no problems. I have of course been on plenty of times from my residence in the US as their server logs would show. The support rep said their system was flagged that I may have registered with false information and I needed to send them proof of who I am and where I live. I offered to email a copy of my passport and a blacked out bank statement I can get online from my bank, which would show my address(really they should only need the passport as it provides all the legal info they need for my right to work). They stated that email will not work, they need hard copies. I politely replied that I would consider this next time I am in the States, but they may wish to re-examine their procedures. At some point enough people will decide they are just not worth it and their production will be at risk. Not to mention the reputation hits they are slowly starting to accumulate. I have never cashed out there so I have small amount lost, no biggie. Remember, there are plenty other crowdsourcing sites out there. For me this one is more trouble than it’s worth. We’re both supposed to earn a little extra if you use the link. It is allowed, but IF there is a suspicion regarding one account of that household, all accounts need to be verified, because of the chance that they all belong to the same person instead of being used by several persons. We would therefore ask your roommate to get in touch with us and send us some documents as well. Please let him know about this. Me and my roommate had already sent them documents to proof our identity. Its been a week now since I last heard from them. They were responding diligently to my email inquiries up until this point. It seems as though they are now avoiding to resolve the issue after I had comply to all the request they had made in order to restore my accounts. This seems to happen to people who accrued large amount of earnings as you have said. With that said, they are very fishy in terms of paying people who had earned large sums. It is very frustrating to be stripped of earnings I had made through the hours and devotions I had put into them. To make the matter worst, my experience is not an isolated situation with Clickworker. Frankly, I don’t think they are a trustworthy company to work for. I agree with what you said about Appen’s setup, but I have always been paid by them as scheduled. And they had always respond to my inquires the next day. For those who are trying to get feedback before joining Clickworker, keep in mind that they might withhold your earnings if you begin to make a lot. Clickworker is a fail. I completely understand. I worked for a company for a while and made close to a thousand dollars in one month. I then had to go through company bureaucracy to get paid and ended up only getting half. I do hope you get your money because you earned it fair and square as well as your roommate. I would keep trying to contact Clickworker and keep asking them what it will take for you to get paid. I know it’s frustrating and all but it’s your money and you earned it fairly. You do deserve it so don’t give up. I agree with you, I have heard a few stories about payments and other problems with Clickworker but to be honest with you I have heard stories about every company. There isn’t any perfect company out there sadly. Companies just aren’t trusting the people they hire as employees or ICs and the people trying to earn the jobs aren’t trusting the companies either. I don’t know anymore how both sides get past that. It seems to be an ongoing problem with working from home especially. I think my biggest complaint is how small these companies are paying for the jobs they are offering and for the amount of time we have to put in to complete a task or assignment and yet in many instances we don’t have a choice. It’s either earn the little bit these companies are paying or live on the streets and not working and not have anything at all. So we keep chugging away hoping for a better tomorrow while the workers at these companies work their 9 to 5 jobs and get their pay checks every week no matter how much work they have done. I’m sorry I don’t mean to get on my soapbox but sometimes I just do. Companies forget about the people working from home for them and they don’t really know what it means to even earn the few pennies we do at times. It’s sad! I wish you all the best GC and I do hope very much you will be able to get paid from Clickworker what you honestly earned from working for them. I find Clickworker to be way better than some of the other ones. I personally don’t like Appen’s setup at all but to each their own. The ones with Clickworker who seem to have the most problems are ones who are either earning large amounts of money or who have been in situations like GC said above. It’s unfortunate but from my own experiences anyone who has a situation like this for most any company will run into the company questioning it. The reason being it makes it appear like one person is working under two accounts which is against their policies. I ran into this type situation myself a while ago working for a company in another industry where a friend and I worked for the same company and I let her use my PayPal account as well. When it came time for pay the company said uh uh uhhh and we had to produce all kinds of information to show we were two different people. Had we talked to the company before signing on we could have alleviated the issue. In the end one of us had to quit because two people on the same PayPal account was not allowed. Clickworker is a good company. Maybe not the best but I for one have not had any problems with them. When I had contacted the company they always have gotten back to me within a reasonable timeframe. You have to remember that they offer work to people all over the world and at times workers have questions and they contact them for answers so it can take a while for them to get back to you. I am sorry that some have had problems with them but everyone has different experiences. I for one am very happy with this company so far. Do not work for Clickworker. I signed up about month and half ago. In about 4 weeks, I made roughly $600 doing UHRS work. On my first scheduled payday, they sent me an email saying my account has some suspicion and document of identity is required. I live with my roommate and we both signed up for Clickworker. We share the same PayPal account for Clickworker since my roommate does not have PayPal. I believe it is for that reason Clickworker decides to suspend our accounts. To verify our identity, we had emailed them our bank statements and identification cards. Our earnings was delayed and currently still had not receive anything for the work I have done. I have sent them numerous emails. Reply is slow. At this moment, I am beginning to feel I will not be paid for the dedication and time I spent the last month working. In order to apply for Clickworker, you must provide accurate social security numbers. I do not understand why with such confidential information, that there will be any suspicion the accounts were set up by the same person. It is just bad business ethic to withhold earnings from someone. Together with their poorly set up help support, my advice is do not work for them. There are other companies which offers the same crowdsource works. Appenbutler is one that is much better than Clickworker. DO NOT WORK FOR CLICKWORKER. Do some research and you see will there are others who is experiencing the same issue regarding payments. I’ve been working at clickworker particularly UHRS jobs for 3 weeks now but yesterday until today I don’t have the UHRS link(compare web results).Does anybody here experienced this problem>? I just started on Clickworker this week, and am rather pleased. I’ve been able to make around $100 (mostly through URHS). It can be boring as hell, but beats surveys, lol. Is clickworker.com still available to US residents, mainly the UHRS tasks? Unfortunatelly, clickworker.com has closed for most of the countries now. How can I get the UHRS assessments? Do they just pop up because I took 3 of them but they were not for UHRS. Please help and thanks. They recently deactivated a bunch of people who thought they were doing the tasks correctly, but it was technical error which workers constantly reported… After deactivating everyone temporarily and withholding EVERYONE’s pay for 2 weeks while they tried to “clear things up”, they activated people little by little during that 2 week period , but made it clear they were not paying anyone to work. Basically, they wanted people to work for free to test out the system. I know people who worked hard to earn money, and then to find out they weren’t getting paid? I worked for 2 weeks just to find out if I would get paid. I got $3 on my first deposit, and the next day is when everything hit the fan. And Cheryl, I noticed you actually got a reply from them? Multiple times I had issues with the evaluations not grading correctly (I’d take it, it would say it was wrong, so the next time I took it, I’d put the answer they said was correct, and it was still wrong!). No matter how many times I reached out to them, I never got a reply. Well I came back to maybe eat a little crow and give some praise for this company. I did get a response to the email I had sent. The one that emailed me back was very kind and courteous. She did change my grade so I passed and she did take a moment to explain things to me. I thank her for the reply. I wasn’t expecting my grade to be changed as much as I was hoping for a explanation but I got both. I think that says a lot for this company and wanting to do right by their workers. They do pay well depending on the task I start working there the middle of October and have already make three hundred dollars with them already in the uhrs task. Once you are qualify under uhrs you get different tasks to do for different rates it have some that pay more and some pay less. I wish you luck please make sure and do the assessments to find work available. Thanks very much for your reply Pat. I think I am going to give this a try. Thanks for providing such an useful website . Before This I used Cloud crowd which is also same website , with an quite easy to understand platform . Clickworker.com looks like a very promising site but during signup, they asked for my date of birth (DOB), which makes me almost as uneasy as if they had asked for my social security number. With identity theft being such a big threat these days, I always try to refrain from giving out personal information such as DOB, SSN, home address, etc. I would not have minded this site asking me for my age, but so far as my actual DOB, I feel very uncomfortable. An identity thief can uncover a lot about a person just from that one piece of information alone. Am I the only one who feels this way about giving out my DOB? Am I making a big deal over nothing? Well, they will have to have it at some point … if you make more than $600 with them, it will be something you’ll have to file taxes on, and they’ll need all your info for that, just like any other job outside the home. I understand your concern about submitting the information over the internet, but honestly I think you’ll be fine. As far as that goes, I am personally a lot more cautious with my SS# than I am my date of birth. Chances are excellent that your date of birth is already out there online somewhere anyway if you Google yourself. And Clickworker is a legitimate company. I have a lot of readers who talk about and recommend them all the time, plus if you visit any of the popular work at home forums on the web, you’ll see a lot of feedback on them and people reporting being paid. That said, it’s all up to you. I completely understand being protective of your personal information — especially when it comes submitting information online — so if you decide not to sign up for Clickworker or other online work opps because of that, you wouldn’t be the first one. But if you want to work online, most of the time you will have to send some of these personal details about yourself over the internet unless you can get the company to be OK with you mailing it. That is another idea — maybe contact them and see if you can mail your details to them? Thank you so much for your extremely helpful and thoughtful reply. You have answered all my questions and given me some good ideas. And BTW, I really enjoy your website. It is, by far, the best I’ve seen of all the many other work-at-home websites I’ve come across. You have a fantastic wealth of information I have not seen anywhere else. No problem, and thank you so much for the kind words!! I appreciate it. Click Start through the job link. Calculate the amounts from each type of job you’ve done that week and thats the amount you’ll get in you paypal. I asked if I can put a referral code for Clickworker on here, and was told I was allowed to. If anyone would like to join Clickworker, click on the below link! I’ve been with Clickworker for a long time. The site is legit, but has its share of problems. The tasks don’t always work right, and payment is random. I don’t think there is a $10 threshold; I have been paid with as little as a few cents. Right now, there are some decent tasks on there. Some days, there are none. And some tasks are so convoluted that they are impossible to do properly. I have recently started on clickworker, and have been doing a lot of the ”compare web search results” on the UHRS bit. If I click on the report on UHRS it shows up the money that I have earn, however on the clickworker site it does not get added to my balance. I have also been clicking save on the clickworker page that directs you to UHRS. This shows in my clickerworker balance as ”credit” but for 0.00. Am I doing something wrong or do I just need to wait for them to approve what I have done? I do not want to keep going if there is a problem and I am not going to be paid for my time. Any ideas/experience on this much appreciated, thanks. I am sure this has been resolved by now, seeing as it is over a month old, but UHRS tasks take 3 weeks to be paid. Never worry about being paid on UHRS. As long as MyReport shows work done and amounts, you will be paid those amounts. I have started working through the assessments on clickworker. The 1st one is:-Exercise to Research for Correct Address Data. Example:-234 Blueridge Lane, 2nd floor. This I did on all 3 of the addresses given and was marked down when they posted the answers,according to them should have been,i.e:-234 Blueridge Lane. I have been working the UHRS task on clickworker but I am worried that I’m not receiving credit for my work because under my job history on the clickworker site it says “timedout” under the status of these items. What could I be doing wrong? Era, you will be paid for anything in UHRS that is listed under “Potential Earnings”. Do not worry about the “timedout” message. That is there because “Web Search Results” is a task listed under marketplace on the CW website, and they had to put something in for the time. Check out the Facebook community and respond there or in the Clickworker forums if you have any other issues (I am a newer mod to the UHRS English Forum for Clickworker). I just joined Clickworker a few days ago. Would you explain what “UHRS” stands for and which assessment I need to qualify for it? Clickworker is my favorite task site. I couldn’t do it much on my old pc. When you do the UHRS site, you can only use IE. I’ll do it an hour at a time and make pretty good money doing that. For the ones saying they don’t see certain jobs, make sure you take the qualification tests. But especially do the UHRS pages, you’ll make more that way. I like how they pay every week, it used to be every Friday but now it seems not regular, not sure if they’re having some kind of problem, but its still once/wk. There were a couple of issues when they switched to a Wednesday pay schedule, but that was all worked out a while ago. Does anyone know another site like the Clickworker? I did about 40 euros a week, but one week ago has no work available. They don’t “reject” work on the UHRS platform. If you get too low a SPAM score, they just lock you out the particular HitApp, but you are paid for all the work until then. Clickworker pays MUCH better than Mturk. Has anybody here been working the UHRS task on clickworker? I just started and they are quite easy and seem to be worth the money, but I was just wondering what people’s experience was getting their work approved and paid. It says it can take up to 21 days for approval and it pays after 21 days. I want to know my work will be accepted before spending hours on this without having to wait 21 days! I am also working on UHRS tasks from 3-4 days. But my most tasks are not approved. In ”compare web results” most tasks are getting rejected even if I am 100% correct. But I am getting fair approvals in ”find websites” tasks. I have now been working on Clickworker since April. UHRS is basically the only jobs I am qualified to do on the Clickworker site. All work is “accepted” in UHRS. If your SPAM score goes too low, you are just locked out of that particular HitApp you were working in. You are still paid for the work you did before you get locked out, if it happens. I make at least $40 every week. Your first pay doesn’t show up on the main Clickworker page until about 3 weeks later, but you get paid that Wednesday through Paypal. How many hours per week do you work for that $40? I can work as little as 2 to 5 hours to get the $40. Thanks for reviewing this. There seems to be so many of these sites, it’s hard to know what’s worth your time. MTurk has left a bad taste in my mouth, this one looks like it’s maybe better. I would like to hear more experiences with this site. Has anyone used it much? I have tried Mturk, but I would usually be paid about $2 for a couple hours of work on there, and it really wasn’t worth it. Nine dollars an hour average sounds pretty good for this kind of site. I signed up with Clickworker about a month ago. I have taken every assessment available to me and passed them all. I have been very disappointed with the company thus far. No jobs are available yet. I also feel that they may be having trouble getting business, I was given the maps test and they kept telling me I was answering incorrectly to answers that were clearly correct. I am talking about very simple visual questions on whether a photo is blurry or not. It has wasted countless hours and caused me a lot of frustration. I think it would be wise to move on to other sites until they get their act together. Jill, you have to do the “Compare Web Search Results” qualification (Only available in a few different countries). If you pass that one, you get into the UHRS database where most of the jobs are for US workers. I have made over $75 there so far just by doing the apps on UHRS through Clickworker. Another great thing about Clickworker is that they do have a Facebook group that you can join – it’s a great place to find out about issues the site might be having, and also a great place to get more information on certain tasks. Have you worked with clickworker before? I ask because I just signed up and at the top of page it says there are 129,900 jobs available and 139,700 workers online but when I do a search for jobs it says there are none. Are you not able to see the jobs unless you are qualified for them? Thanks for any info. in advance! Clauemi – I think you have to take assessments before you’ll be able to see the jobs. It’s set up so that you only see the jobs that you’ve passed the assessments for. I have not used the site myself (although I’m thinking about trying it) but from what I read, that’s how it’s set up. So like if you want to see the editing jobs, you’ll have to first take the editing assessment, etc. Erica – Would you mind sharing the Facebook group link here, or is it a private group? Thank you! For the time being, you have to take at least one assessment (and pass it) before you’re ever able to see or complete any of the tasks. However, I’ve only ever seen two assessments available to me for taking since I signed up (which was a year ago, but I didn’t find time to take my first assessment until less than a month ago.) The thing is, even though I passed my test and have been able to view/complete tasks since the day I passed the test, there’s only been 1 type of job on the list for me to take & I don’t like it. LOL. It’s the Google search job which pays 0.03 cents for each task. The task requires you to do 2-3 Google searches per task. What I dislike about this task is that you are required to stay on the site (that you click on after doing a Google search with the words provided) for 2 minutes, so it takes a good 4 minutes just to earn that 0.03 cents. Since this is the only job available to me (and I suppose many others), that’s way too much time involved. You see, I started out as a mechanical turk for Amazon, which is very similar to Clickworker only far better, in my opinion. And I really hate to say this because I ended up being screwed over (forgive my language) by Amazon on this. It’s a long story, but what happened is I did the jobs for over a year and was very high ranked, which means I was eligible for a lot of jobs (your eligibility to earn higher pay and a larger variety of tasks goes up as you do a super job). Over time, one can really get a reputation with the companies who put the tasks out for us to complete. The better job you do, the more opportunities available to you. Also, there was no hour long assessment tests to endure with Mturk. With Mturk, as soon as you start, you have hundreds of various tasks you’re able to accept and complete. They range from all sorts of different things, including similar Google search tasks as what Click Worker has. However, each Google search task requires quite a few different searches you have to perform to earn your $ for that task. So, when I was there, it was typicall around 0.05-0.10 cents per search task. 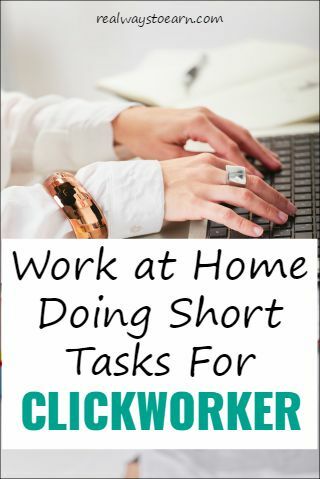 You aren’t required to spend any specific amount of time on the links like Click Worker makes you do, though, so you could earn money quicker. Not to get too lengthy here, but I wanted to make a few comparisons there. My problem with the Mturk job was that after over a year of working, I suddenly received an email from Amazon asking me to click a link, then go fill out this form asking for my social security number. I thought it odd that they would all of a sudden want this info, so I first went to Amazon’s support section to read up on it. It said they would never ask for personal info, such as your SS#, and that if you ever received emails asking you to provide personal info such as that, then to report it to their phishing dept. I did so, letting Amazon know about it and that the emails were threatening to basically shut down my account if I did not fill out the form. I did not fill out the form with my information since their website warned against doing this. I continued to receive the emails asking me to give my info. They said if the info wasn’t submitted within 3 days, I would no longer be able to stay on and work as a mechanical turk! I tried getting into my account before the 3 days was up and it wouldn’t let me work. I emailed Amazon asking them if their email asking me for my info was legit since I was no longer able to work. They emailed me back, but without an answer if it was legitimate. So I decided I’d risk it and filled out the form with all of my information, including my SS number. I thought all was well, was able to get back to work & everything. Until a few days later, I received more of those emails saying I had 3 days to fill out the form or else I would not be able to continue working. I thought maybe my first form didn’t go through or something, so I clicked the link in the email to go RE-fill out the form. It took me to a page telling me I’d already completed that step. It didn’t give me the option to re-do it. The emails kept coming, I kept trying to re-fill the form and continued emailing Amazon letting them know the entire thing from the day I got that email on. I got no helpful answers from them at all. They would not answer whether the whole thing was legit or how I could fix it. I told them I’d already filled out the form, asked why I wasn’t able to continue working although I’d done so. No answers. And I have a couple hundred dollars sitting there in my account that I can’t even use. Amazon won’t even let me use my earned $. So, obviously, I hate to admit that Amazon’s program is 10 times better than Click Worker. The only problem at all is how they handled this situation with me. I’ve been able to get nowhere with it and it was at least 6 months ago. I’m not sure if this has happened to others or not, but I do plan to take action to try and at least get my earned $. I also have most of the whole situation (including screen shots and saved emails from every conversation I’ve had with them) documented and figure I’ll end up publishing it online in hopes of getting them to finally handle the issue. Anyways, I apologize for such a lengthy message. I didn’t plan to share my whole darn journey here, but got into it anyways. I hope this helps in some way. I’m hoping that us newer Click Workers will eventually be able eligible for more jobs besides the one. I assume you have taken at least that first assessment? If so and you still are not seeing jobs available (you should at least be getting that one Google search task, like me), then it might be something to do with your scoring. I recall reading as I took mine that you must make a certain score or you won’t be eligible for some tasks. I don’t know. I would get in touch with their support, though. Also, I think Click Worker has a forum where you can ask questions from other members, but I’m not 100% sure. I would go there and ask if I were you. Check all the assessment available when you log into your account. I only ever saw two available to me. I only took the 1 as I really just don’t have time to sit through almost an hour again for another one of their tests if I’m not sure it’ll allow me to complete a bigger variety of tasks.